34 cm tall (13 inches). 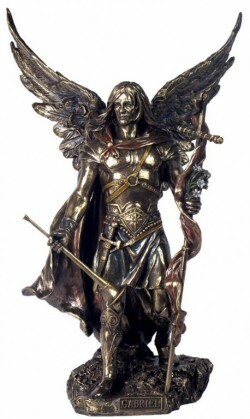 Bronze-finish guardian angel warrior. Messenger of God. Gabriel is sometimes depicted as a female. Here the figurine shows a male Gabriel. We also have the female version bronze figurine. Includes a collector's tag with extra info about Archangel Gabriel.